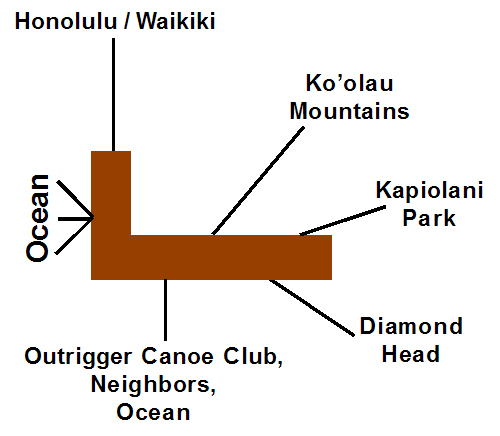 The Colony Surf is located in an area of Honolulu with many names - "Sans Souci," "Diamond Head" and "Gold Coast." In ancient times, only Kahuna or priests were allowed on the slopes of Diamond Head and the area was then known as Kaluahole. Today, we think of the Colony Surf as being about a half mile from the center of Waikiki on the other side of the 108-acre Kapiolani Park at the foot of Diamond Head. From the geological information available, it's apparent that the Diamond Head area was well populated by ancient Hawaiians. Perhaps the climate is responsible. The area is favored by a subtle microclimate: a little cooler, less humid and just the right amount of rain showers - a very ideal place to live. 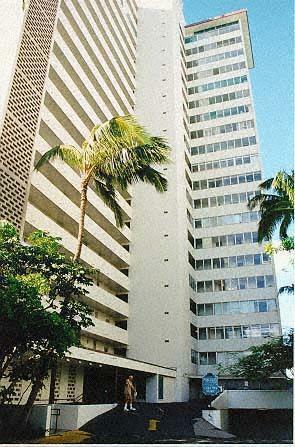 The Colony Surf is also one of the few residential buildings in Honolulu with its own sandy beach. It's the perfect place to swim or watch Honolulu fireworks. John Barkhorn, the designer and builder of the Colony Surf, lived in a house on the undeveloped property in 1942 for about a year. After a return visit in 1958, Mr. Barkhorn arranged with the late Mr. and Mrs. Darrow, the owners, to lease the property to build a co-operative apartment building. The remaining property utilized by Mr. Barkhorn was leased from the Wood and Gamble families. It would take 44 years for the Colony Surf to purchase all the lands under the building. The last, from the Wood Estate, closed in September 2003. The total cost of acquiring the land was ~$13.5 million for just about one acre! The Colony Surf is built of steel reinforced concrete and is unique by current standards. The walls between apartments are 6" thick, creating a very soundproof and exceedingly strong structure. Edwin A. Baker, a noted Honolulu architect, prepared the drawings from Mr. Barkhorn's designs. Supporting the building are concrete pilings sunk through 40 feet of sand and coral into the bedrock of Diamond Head. During construction many ancient Hawaiian burials were discovered. This led to the blessing of the property by "Daddy" Bray, a Hawaiian Kahuna, who prophesied that the site would be "forever a very, very happy place to live." After over fifty years of experience, we feel that "Daddy" Bray made an excellent prediction. The "L-shaped" building, the tallest in the area, rises 19 stories (plus penthouse) with 172 apartments - nine per floor. Units are "stacked," meaning the floorplan repeats itself on each floor. There are only two apartment sizes - the 500 square foot studio and the 845 square foot "1-bedroom." The larger "01" and "04" units gained space when they were allowed to enclose the dead-end hallways. In 1961, Mr. Barkhorn added the 3,400 square foot penthouse, his personal residence. In truth, the larger units are actually large studios which originally had floor-to-ceiling shutters which could be pulled closed to separate the sleeping area. Units also had a series of arches which separated the main window from the living area to form a lanai-like area. Today, owners have removed most of these outdated design elements. Apartments have two unique features. Having no walls, all units share an open loft-like design. Adding to this openness is a large main window that stretches the full width of each unit - 14' in small apartments and 26' in the large. This design gives each unit the feeling of being outside. Apartment numbers consist of a floor number and unit number - e.g. 501. Smaller-unit numbers end in '03, '06 and '08 while the larger-units end in '01, '02, '04, '05, '07, and '09. Oceanfront units are '01-'04 with the remainder having an ocean view. Ocean front units have views of the endless Pacific. The Penthouse, built atop the '01-'04 oceanfront stack, has windows on all four sides and about 270 degrees of unparalleled views. On the ocean view side of the building (units '05-'09), floors 1 and 2 have almost no view because of a volleyball court fence erected by the Outrigger Canoe Club -- the 3rd floor just clears the fence. Floors 4-10 have excellent Diamond Head and ocean views over the neighboring single-story Outrigger and Elk's Club buildings. Floors 11 and higher have sweeping views over nearby high-rises, taking in the curve of the island. Originally there were awnings across the front of the building to protect the oceanfront apartments from the intense afternoon sun. They were removed due to maintenance issues in the 1970s. Also over the years, owners have acquired adjoining units and connected them to create larger spaces. Connected apartments are always on the same floor with one exception. In 2002 the Penthouse purchased the '02 unit below to install an elevator. Because the Penthouse was added later, access was via a staircase from the "top" floor. The sandy beach shared by the The Colony Surf and the Outrigger Canoe Club was created in 1964 by the Canoe Club and expanded when Colony Surf was built. 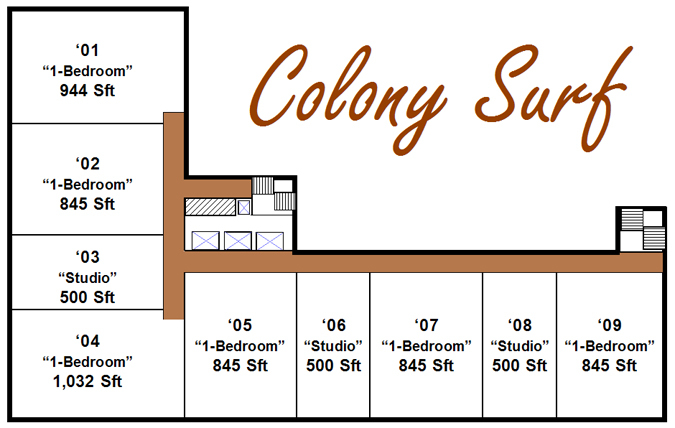 In the beginning, the Colony Surf building was to be 100% co-operative apartments. Shocking given values today, sales were not as brisk as expected. Mr. Barkhorn gathered the unsold units together to create the Colony Surf Hotel. He also reallocated space from an owner's recreation area into a restaurant - today's Michel's. The Colony Surf is part of a trio of neighboring buildings constructed by Mr. Barkhorn. These included the eight-unit, eight-story Colony Beach and what is today known as the 48-room Lotus at Diamond Head Hotel. At one time, all played a part in the Colony Surf Hotel operation. Today, only the Lotus Hotel remains as a hotel property. The Colony Beach and Colony Surf have finally fulfilled the original plan of all residential usage. One anecdote from the construction goes that Mr. Barkhorn enlisted a local merchant to provide the shutters for the windows. Suspicious of the detailed drawings he was required to give, the merchant added ½" to each measurement. If his drawings were being given to someone else to fabricate, the ½" would cause Mr. Barkhorn big problems. The merchant's suspicions proved correct, the shutters were fabricated overseas. When the shutters arrived, naturally they did not fit. Each shutter had to be cut down to fit the windows. Mr. Barkhorn used the merchant again, but never again tried to gyp him. The 17 high-rise buildings on the Diamond Head end of Kalakaua Avenue are unloved by photographers and politicians alike. After the initial building boom that created them, the city of Honolulu banned future high-rises at the base of Diamond Head. The opinion was that the area would be overrun and views of Diamond Head would be blocked - they were probably correct. This action created the Diamond Head Preservation Area. The bottom-line being that if a high-rise building is knocked down or damaged beyond repair it will not be rebuilt - new structures are limited to three-stories. Given the wealth and power that resides here, this statute would be surely be challenged if disaster struck. As it is, no structural or usage changes can be made to the buildings without excessive amounts of government approvals. By "usage" I mean that the Colony Surf, while once a hotel, can not revert to one again. Once a usage has been stopped, it can not be restarted without approval. Until recently Michel's only served dinner but have recently won approval for Sunday Brunch. While this may sound confining, it also protects Colony Surf owners. Because no building can be built over three stories, apartments on the side of the building will never lose their views. This is especially important as the Outrigger Canoe Club has explored adding a second story over the years. Photographers, keen to capture the essence of Diamond Head usually crop out the buildings that make up the Gold Coast.